Left Namche Bazaar after lunch to head to Khumjung where we will stay at the tea house for 2 nights for acclimatizing but not before I get to check out the market. The climb up to Namche is probably the greatest trail…..ever. It’s through the pine trees and winds up on the side of the mountains and gives one the first view of Everest. So the day starts with a heli ride into Lukla, the most dangerous airport in the world. It’s got one runway and it ends with a cliff on one side and the mountain on the other. Did I say it’s uphill? So tomorrow at 6 am we leave for the airport to fly by helicopter (5 flights) to Lukla which is about 10,000 ft. From here we begin the trek into Everest Base Camp and will spend the first night in Monjo at a tea house. It’s a pleasant hike along the river and along the high river banks. Probably be in shorts with a small pack with some warmer weather clothes for when the sun sets. It’s time to leave Katmandu and the great food and other creature comforts like a soft bed and hot shower. It’s expedition time. The mountains are calling, wanting to share their stories. But will they be sharing stories of clear skies and gentle weather? Time to go and see. What's Going On In Katmandu? Motorcycles. Lots of them. Lots and lots of them. Driving is a continuous game of chicken but with multiple players including buses, cars, pedestrians and, wait for it, motorcycles. It’s actually a high stakes game of a chicken because your life is on the line. And Katmandu has it’s monks and prayer flags. The stupa is amazing with a set of eyes always watching. It’s a religious theme throughout Nepal, a set of eyes watching. 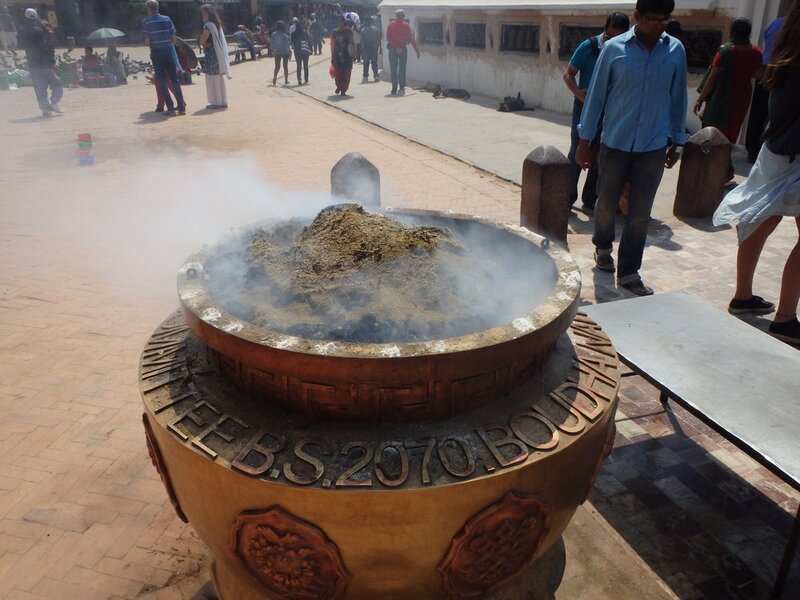 The smell of Katmandu is definitely burning juniper. It’s burning everywhere. 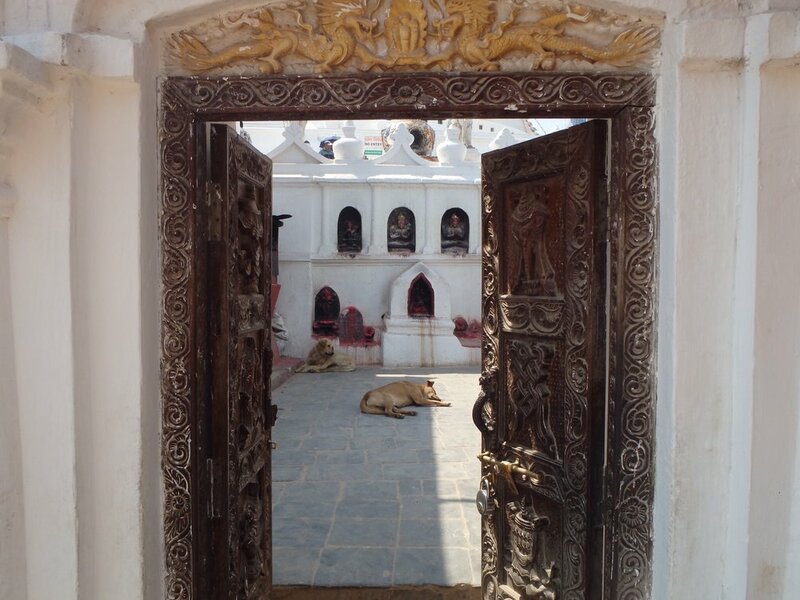 Shop keeps, motorcycles, Buddhist monks and dogs napping….. Welcome to daily life in Katmandu. Everything is small tiny shops selling whatever they can. They are everywhere. And motorcycles honking their horns driving everywhere but between lines, mainly because their are no lanes. Buddhist monks in their red “flowing robes” (yes, a caddyshack reference) and dogs, mangy dogs napping everywhere ignoring everything. The simplicity of their lives in that they nap where ever they choose obviously feeling safe is offset by, from the looks of them, the harsh existence of surviving in the streets. But what is most shocking is the meat markets where meat is sitting out covered in flies. Here in Katmandu at night and immediately you notice the lack of lights. It’s erie. No street lights and only the dim lights in front of open store fronts. Dogs and cows roam the streets. Motorcycles everywhere buzzing about like annoying gnats. And dirt….and garbage. And dirt. Did I say dirt? Everything is shadows and people moving about but never quite in view. And dogs barking in the night. And then the power does out….but comes right back on. No one reacts. It’s obviously a normal occurrence. I count. 7 dogs barking in the distance. And then my waiter brings me an Everest Lager. The special limited edition. And the waiter, like the people, is the nicest man probably in the world. Everest lager rocks. Life on the other side. The journey begins but it starts off awash with luxury as I fly Ethiad Airlines, truly the greatest airline on the planet. Wood floors, leather, great food, all on new planes that are beautiful. So don’t feel sorry for me yet! Now when I get to basecamp, then feel free to feel sorry for me as I live on rocks and ice at 17,000 ft. But til then , I’m living the life. Cheers. See you on the other side. Headed to Everest in under 48 hours. Katmandu here I come.